Lie on your back with hands resting below ribs and knees bent. Tighten abdominal muscles to squeeze ribs inwards. Stand with your back leaning against the wall. Position your feet 12 inches in front of body. Stand distributing your weight equally on both feet. Slowly raise your heels off the floor and hold for 5 seconds. Then slowly lower your heels to the floor. 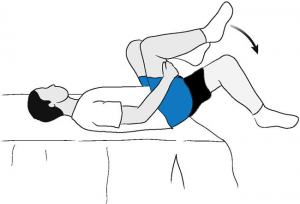 Lie on your back with right leg straight and left knee bent. 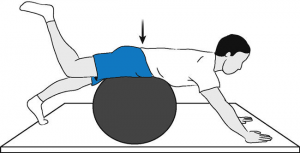 Tighten your abdominal muscles to stabilize your low back. 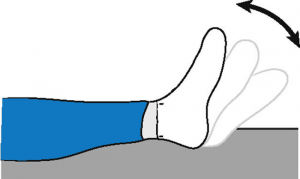 Slowly lift the right leg straight up, to 12 inches and hold for 5 seconds. Hold thigh behind knee with your hands and bring one knee up to chest. 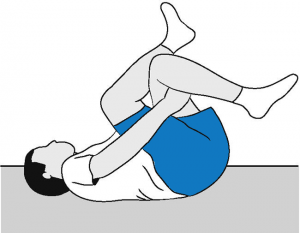 Lie on your back with both legs bent. Gradually straighten knee, until a stretch is felt in the back of thigh. Lie on your back on edge of the bed, holding knees to chest. Lie on your back, bend both knees. Gradually raise arm over-head and lower it, alternating right and left sides. Similarly straighten one knee and relax, alternating right and left sides. Gradually straighten one knee and raise opposite arm over-head. Alternate opposite arms and legs. 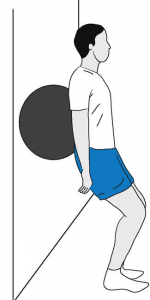 Walk the ball forward and backward with legs. 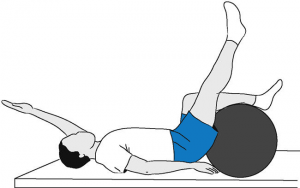 Sit on ball with hips and knees bent 90° and feet resting flat on the floor. Similarly raise and lower heel, alternating right and left heels. Slowly bend knees 45° to 90° while raising both arms over the head. Slowly raise alternate legs 4 inches from floor. “Walk” hands out in front of ball until ball is under legs. Reverse to starting position. Again “walk” hands out in front of ball until ball is under legs, then slowly raise alternating arms over head. “Walk” hands out in front of ball and gradually do push-ups.